Part of the reason this blog needs a name change? I've taken up needlecrafts again (well, knitting mostly and crochet as a runner up), and want to be able to post things I've done and things I'm working on. Hopefully that sort of peer pressure will help me complete things! Yarn: I have no idea. Some yarn that came to me from my late grandmother's stash. I know it's an 8 ply, and I think it's a wool/acrylic blend. 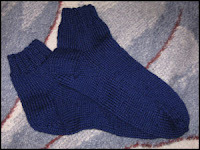 Pattern: Part Arachne Sock Calculator, part Kim Goddard's beginner sock pattern, part my own imagination. I used the magic loop method, Knit Picks 3.25mm/80 cm circular needle. I'm still building the DPN patience and skills. Next project? Already started... more socks, amongst other things.